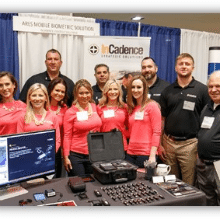 At the 2016 American Council for Technology (ACT) – Industry Advisory Council (IAC) Igniting Innovations Awards InCadence Strategic Solutions won the “Transformer of the Year” award for its mobile biometric solution, AresTM. The ACT-IAC Igniting Innovations Awards were held on April 25th at the Renaissance Hotel in Washington, D.C. This award acknowledges an innovative program which uses existing technology to transform or extend capabilities resulting in new or broadened applicability and use.